Sometimes they make earning points so easy! This is one of those times! 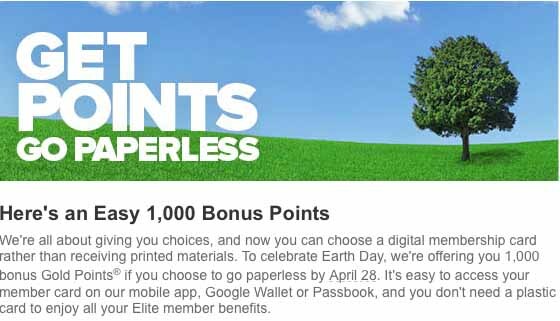 Club Carlson (the loyalty program for Radisson plus some other chains) just sent me an email for a free 1000 points if I agreed before April 28 to take electronic statements via email and an electronic version of my membership card. Of course I will do that! Since I have Awardwallet, my membership cards are long thrown away anyhow and I hate junk mail so this is win-win! And if you don’t have a free Club Carlson account, then why not do our Getting Started page now so you can take advantage of the next special that comes around. This offer appears to be targeted for people who are currently receiving snail mail documents so you may not qualify for it. To check, click on the graphic above or this link and log in with your Club Carlson login and password. If you see this banner at the top, then you qualify! Simply click on the red Opt Out button to sign up for e-Statements and an easy 1K points can be yours! Too easy! Respond in the comments if you were able to take advantage of this offer too. Author John ButlerPosted on April 24, 2015 May 1, 2015 Categories Club Carlson, No Credit? No Problem! Next Next post: The easiest 1000 AA Miles you will ever make!